Kathy Quilts!  > Machine Quilting eBooks > Do you have a Grace Machine Frame or other machine frame and don't know how to get started? Quilting with Kathy - Machine Quilting Magic will help give you the knowledge and confidence you need to finish your quilts so it looks like a pro did them. 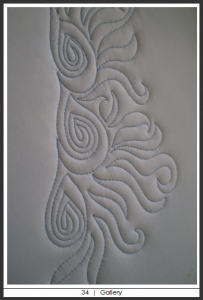 Are you finding Machine Quilting is harder than you thought it would be? 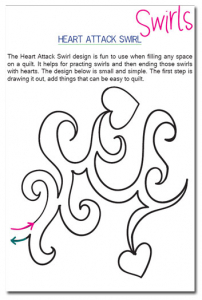 Don't know how to get started machine quilting? I am here to tell you that with the right help you can become an accomplished machine quilter. You may even be a gifted quilter. Kathy Quilts! wants to help you to uncover your hidden potential. Don't settle for mediocre quilting, your quilts deserve more than that. It doesn't matter if you quilt on a shortarm, midarm or longarm machine frame. 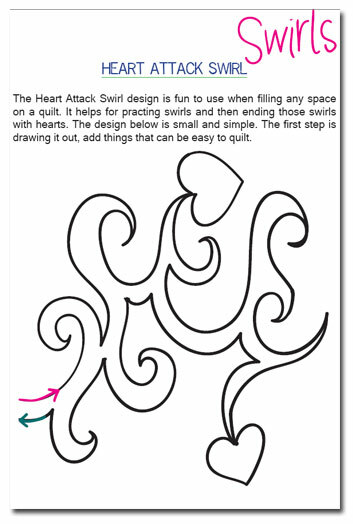 I want you to know that there is help for you to take your machine quilting up to the next level. Machine quilting on any machine frame should be fun. 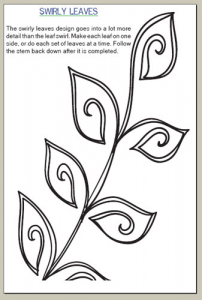 You should be able to freehand quilt, follow pantograph patterns, and use rulers or other pattern guides. You should have the confidence that if you can dream it up, sketch it out on a scrap of paper, you can quilt it. That confidence will come with practice and the right coaching. 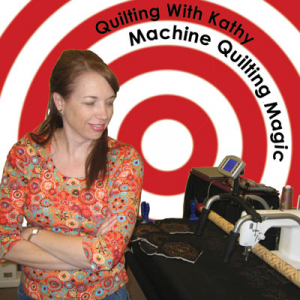 Kathy Barlow is a professional machine quilter with over 10 years of experience. When you have quilted over 2500 quilts, you learn a thing or two. Kathy and Lynn sell Grace frames on their web site and on EBAY. They only sell Grace Frames because they believe that if you sell all brands, that you aren't really convinced that one brand is better than another. 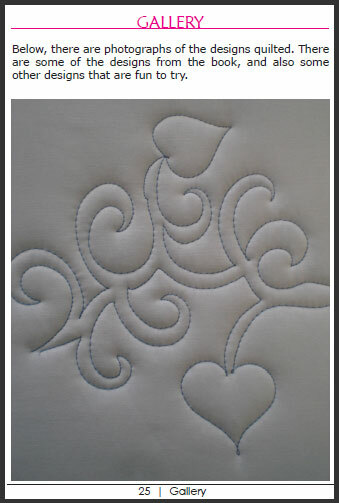 They aren't just after your money, they want their clients to get the quilting system that is right for their needs. Lynn says, "Over the past 10 years we have sold thousands of Grace Frames. The reason for this is because we understand how these quilting frames work. When our customers have problems, we help them find a solution. We don't pawn them off on someone else when they have questions about quilting. " 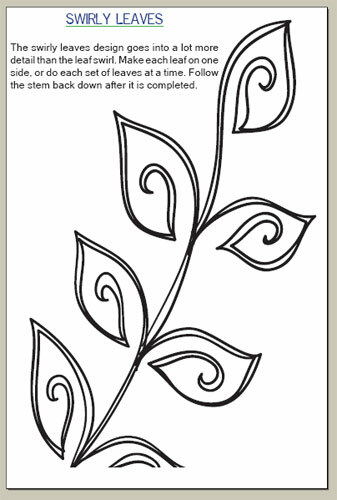 This knowledge is what sets KathyQuilts.com apart from any other quilting frame Dealers. Kathy and Lynn's knowledge of how longarm frames and shortarm frames, work and how to use them. A shortarm frame is one that is designed to use with a home sewing machine, or one that the arm or throat, of the machine is 18 inches or less. Most of the good instruction you find in the machine quilting industry, is for longarm frame owners. This is great, but what about the people who don't have a machine head on their frame that will quilt a 14 inch block with one pass? What about you? In Machine Quilting Magic, Kathy teaches you how to bridge the gap between longarm and Machine Quilting frames. Now you can learn valuable lessons that will help you understand how to use your frame. You need a fighting chance at learning to use your frame. Don't be like too many of the people that have purchased their frame from a dealer that won't support them, so they get frustrated because they don't know how to start using their frame. Then all to often they give up. Learn how to use the hidden potential of your machine frame. Machine Quilting Frame Magic is what you need to get started. Kathy has spent thousands of dollars on classes, and trips to take classes. It is really expensive to learn how to quilt if you attend classes. Many times after you get home, you forget far to much of what you were taught. What a waste! There are also instructors out there that don't have much more experience than you do. What has qualified them to teach you? You need to be so careful. There really is a lot more bad or inferior instruction than good quality teaching that is worth your time and money. If you were to take a hands on class, you could pay about $300 or $400 a day class from a top professional teacher. Books are a good way to learn, but the problem is that there aren't many books that deal with how to quilt on a shortarm frame. Our goal is to help you understand the relationship between long and shortarm frames. You can quilt on your frame. You don't need something bigger or better. Learn on what you have now, then you can see if you need to upgrade. Hi there. I purchased Machine Quilting Magic a few months ago which means I missed out on the $10 off coupon. I'm writing to tell you I'm o.k. with that, because I have benefited so much from this eBook, I don't mind that it cost me a little more. I've read it through and will use it again today as I prepare to quilt a special 60th birthday quilt for my sister. I have the GMQ Pro frame with a Janome 1600P DB. I wish I had known about Kathy Quilts before I purchased this combo, so I agree wholeheartedly with the person who suggested buying your eBook before purchasing a frame and machine. Love the quilt frame. Thank you for the work involved on this book. Can't wait to get home and try some of these idea's. 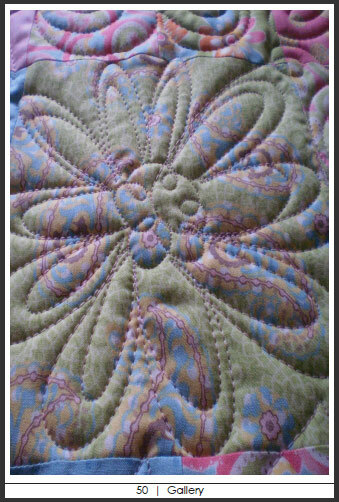 Love the ideas that you give for quilting, especially fill patterns, they were great What inspirations you give us. Thanks! Just read the entire book! It is great and I found some new information there. Wow! What a great book! It is great to have all this in one place. I love the pictures and all the details. We are gathering quite a support group locally and this can be our instruction manual. There are 6 people in the area with Grace frames and I know this will be a great help and expand our skills. I’m really excited about learning how to use our original Grace Machine Frame better. One CD-ROM with Quilting With Kathy - Machine Quilting Frame Magic. In a protective case. Adobe Acrobat Reader 9 if your computer doesn't have it already loaded, or version is an older copy. Instructions on how to load your quilt on your frame. 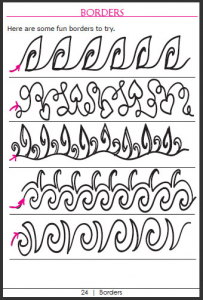 You will also learn how to use pantograph patterns. Learn everything that you need to know about your frame so you can use it properly. Learn how to use fill patterns so you can do more than just stipple your quilt. Learn how to take care of your frame and sewing machine for years of reliable service. Over 50 High resolution images you can use the zoom in function to see the tiniest details. Beautiful quilt pictures that will give you lots of ideas and quilting elements to practice yourself. Far too many people have purchased their machine frames, only to have them collect dust. Your frame was to big of an investment for you to let it just sit there. I find that the number one reason that people are afraid to dive in and get started is that they really don't know how to start. This is the very reason Kathy and I wrote this amazing book. We would love to travel all over the world and teach classes, but that just isn't possible. Machine Quilting Magic is the next best thing. There are many people that are willing to take your money and "Teach" you how to machine quilt, but how many of them have the experience, and knowledge, to help you with the frame you use? How many people will answer your questions when you email them? We are so pleased with the awesome response that we have received with Machine Quilting Magic. Kathy and I are on a mission! We are passionate about what we do. Order your copy today and push your machine frame beyond anything you thought possible. You can learn to be a better quilter. 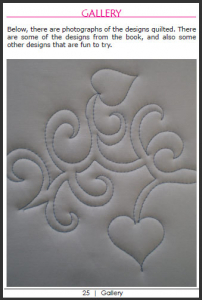 You will enjoy quilting more as we help you with your quest for better quilting. Emma Rae's Designs freehand quilting design helps to go beyond stippling your quilt. Quilting should bring out the personality of your quilt. Don't speed all that time piecing your quilt only to doom it to a drab existence just because you didn't know that there is a better way to quilt. 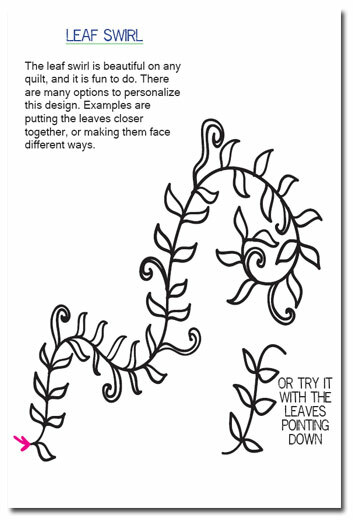 The images in this eBook will give you a great start and a jumping off point where you can take these designs, embellish them and then make them your own. You can download this eBook as well as get it on CD. If you want to order a CD just click on the Add to Cart button. You are welcome to print any of these images to use with your own personal quilting. Calling All Quilters! New Ideas!! By now, most of you machine quilters have been practicing, practicing, practicing. If you're brand-new at quilting - take the advice to just practice, practice, practice. I promise that you'll get so much better! Are you tired of the Loops and Stars? Tired of the old stippling? 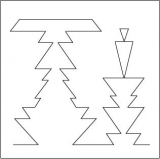 Are you stumped for new designs to quilt - designs that will help you stretch your imagination? Well, I would tell you to ALWAYS look at everything you see with the idea that it might be able to be used as a quilting design. Look at the tiles on the floor, and the pattern they make. Check out the old wallpaper in the restaurant while you're waiting for your food or visiting the bathroom (the bathrooms have the MOST interesting patterns on the walls and floor!) Look at the printing design on fabric or clothing. 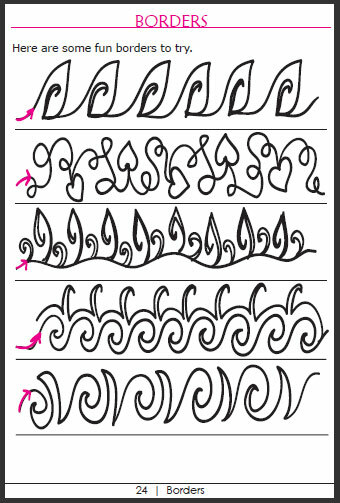 Always keep some paper to doodle your designs on, and save these in a binder for your future quilting use. I've been quilting for 12 years, and these designs are all new to me, so I was excited to try them out. What I like about the book is that there are some designs that are simple to quilt, and then, if you enjoy them, you can add to the simple design to make it a little more elaborate, or leave the design simple and quilt them over and over. There are flowers and leaves. There are swirls and flames. There are waves and spikes. And my favorite is a Party Swirl, with confetti coming off of the main stem. What a great idea! You can use these designs as overall designs on a quilt, or as individual designs in a block, or even special designs quilted in the borders of your quilt. You can look at the designs, and you can quilt them as large or as small as you'd like. I just love it that Emma Rae has saved me the time of trying to think of different things to quilt, and these are very innovative. I'm always looking for designs to quilt on a man's quilt, designs that aren't too flowery, and there are several swirl designs here that I love for more masculine quilts. I had a great time quilting all these designs on a quilt of my own after reading the book.